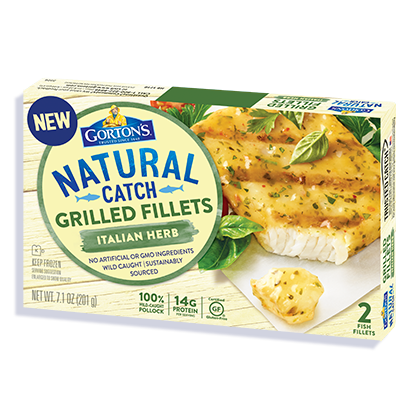 Bring a little taste of Italy home with our Italian Herb Grilled Fillets, and leave the artificial stuff behind. Our 100% sustainably wild-caught fillets are expertly seasoned with real herbs and spices—-there are no GMO ingredients, no artificial ingredients, and no added colors. Water, canola oil, potato starch, sea salt, cane sugar, dehydrated red and green bell pepper, spices, onion powder, garlic powder, whey, dehydrated garlic, parsley, citric acid, jalapeno pepper, natural flavor.